It doesn't take long to get to know Aaron. Once you're around him for five minutes, you realize he is earnest and intelligent. Having known him as my honorary big brother for my entire life, I feel like I have a wonderful history of perspective. More than brilliant in his classroom or in a simple discussion, he is passionate. 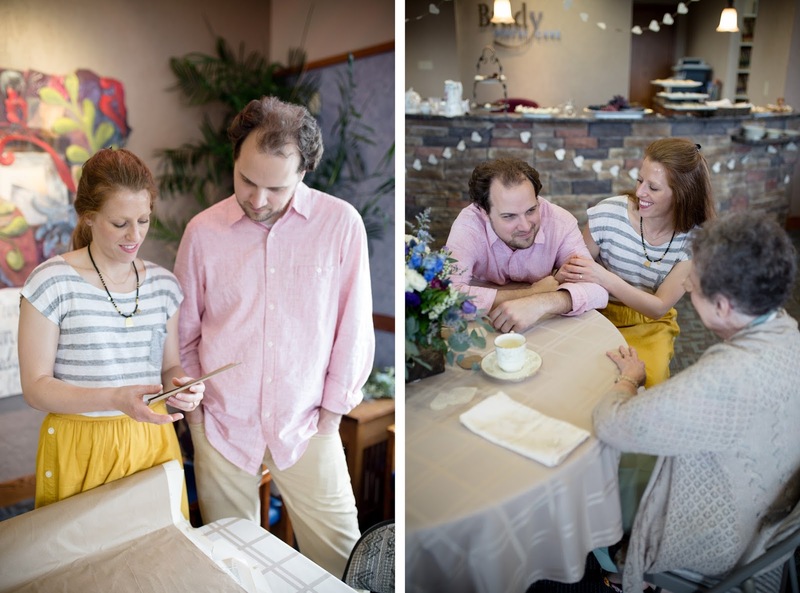 He is passionate about Christ, about literature, and now about his bride-to-be, Addie. As soon as they announced their engagement, my amazing mom and I knew we wanted to host a shower for them. 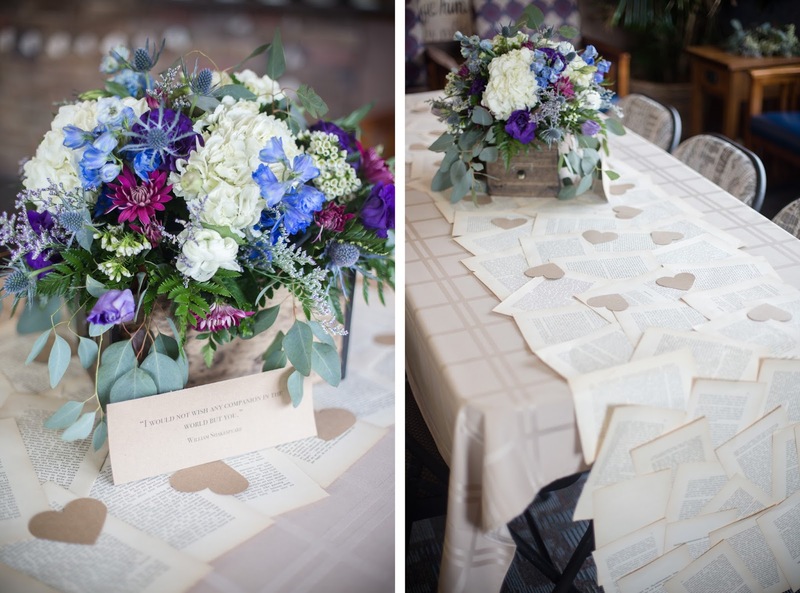 Knowing that Aaron is a hopeless romantic and a complete book worm, I envisioned vintage books, card catalogs and draping greenery. After seeing it all come together this past weekend, I'm happy to say it was everything I imagined! One of the first things I knew would be created was a table runner made from vintage pages. It was astonishingly easy to create and ended up looking pretty amazing, if I do say so myself! And the centerpieces were even better than I imagined. I owe a big thank you to the East Des Moines Hy-Vee for working with mom and me to make our description come to life! If you can't see it too well in the above image, we had a quote displayed with each centerpiece as well. Once the elements started coming together, it only seemed appropriate that we serve an almost-proper tea with mini tarts, chocolates and mini cheesecakes with loose florals about the room. But given that the groom is a coffee connoisseur and half of those in attendance are Swedish, we had coffee as well! But seriously, these flowers were amazing! And placing them in card catalogs? I wish these had been at my wedding! As guests entered, they came upon a typewriter sign guiding them to write a letter to the bride and groom that would be mailed during the first few months of their marriage. Leaning up against the wooden box is one of their invitations for the shower. When you flip back the vintage book page, the invitation details were on a second sheet underneath! Aaron's dad took his letter-writing seriously! 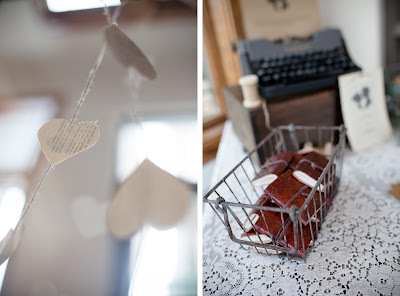 Also draped around the room were heart garlands made from old books that mom and I worked on for quite a bit of time! They ended up adding a perfect touch to the ambiance. Definitely worth it! We also offered party favors of tiny leather-bound journals for guests to take home. 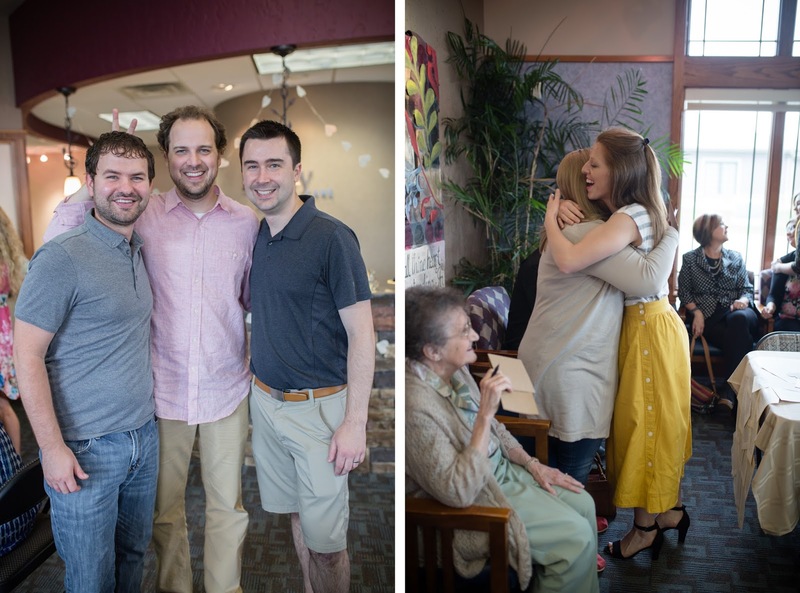 As much as I loved how the decor pulled together, my favorite part was seeing everyone get to know each other before the wedding and just have a wonderful time hanging out. I know I'm biased, but my niece is the cutest! We wanted to keep with the ambiance of the afternoon, but what fun is a shower without at least one game? I found some British Tea rules and decided to make it into a True/False game. It ended up being quite a bit of fun (competitive, even!) and I was happy that I actually was able to fool a few! Can you guess which ones are false? My dad then gave a brief devotional about how building your spouse's self-esteem is so vitally important and one of the biggest things couples want to learn how to do. After praying for the couple as they start out their marriage, it was time to open some gifts! It ended up being such a fun afternoon and I think truly captured the essence of Aaron and Addie. I also wanted to give some accolades to Endor Woodworks for creating these amazing card catalogs for the centerpieces. I'm married to the owner, but I can still be impressed and brag a bit! They turned out perfectly! Aaron & Addie, thank you for allowing us to host your wedding shower. it was truly an honor and I hope you had as much fun as we did! I love you both and can't wait for your wedding next month!